All gaming groups have a natural life, depending on the personal circumstances of its members and group dynamics. After 5 1/2 years of fun, one of our members has finally moved away far enough that he won't be able to attend regularly, if at all. It seems like the end of an era to me, and while I'm sure we'll still be active in various ways, and visit back and forth when we can, I'd like to take the moment to thank my three pals for years of exciting and varied Scaping fun! I've been gaming since the 1960s, doing solo adventures, had local game pals and eventually groups, and even been a long time member of a large gaming club here in New York City. I've done board gaming, miniatures, and role playing over the years, and attended occasional conventions up and down the East Coast. But no gang has been so committed and consistent; and with rare exception we've met monthly, mostly at my apartment, for all that time, playing Heroscape, one single but very flexible game system. I met Kolakoski when he contacted my gaming club here in Brooklyn, looking for an opponent to play Battle Lore. 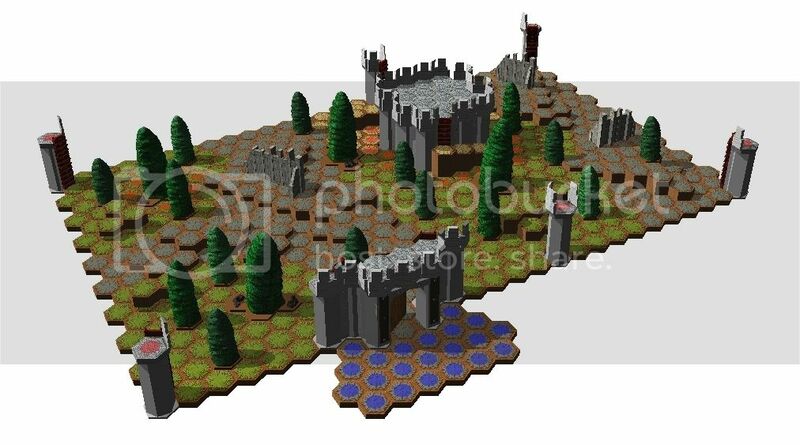 One day when we finished a game early, I had purposely left a Heroscape board set up on the table nearby. As we had a bit of time before he had to go, I suggested we give it a whirl. And so I unleashed him on an unsuspecting Scape World! He became an expert on army building and tactical play, winning or placing high in the Islandscape tournaments we attended in the summer. I enjoyed visiting his home on Roosevelt Island for games. This is that tiny bit of land next to Manhattan that you can visit taking the famous NYC Aerial Tram, although its also convenient to me by subway. For years I would make reference to him plotting on his "Secret Island Base," since although Brooklyn where I live is part of Long Island (home of Griznakh and his gang off to the East, which I visit also), this island is considered pretty exotic even by us NYC dwellers. I'd also go see him perform in singing and dancing show reviews there, where his lovely wife is involved in their performing group's organization and other local social "politics." It was K. who gave our group the name that stuck, as there were clearly four consistent core members. Sherman Davies was in the only organized Scape group in NYC that I knew of at the time, which was playing at one of the first game stores in NYC which had playing tables for customers and hangers on to use as a gaming location (now out of business). The manager of the local comic book store (now defunct) had been talking about (t)his group (which he then soon left), and I met SD for a couple of sessions there. All of the other members soon dropped out, and he and I started playing at my apartment, which, my being a retired old bachelor, is pretty much dedicated to gaming, watching DVDs, and other related activities. Although I had almost no computer skills, he got me up onsite here, and remained a steadfast pal, introducing me to Super Scape through his amazing customs, which culminated in my Great Supers Card Hunt last year, when I compiled hard copy of was to become about 1,200 custom cards, some of my own design. SD could throw up a usable, playable map in almost no time at all, and really knew his Scape cards; today he is a member of The Inner Sanctum designing our C3V cast of characters that keeps our game fresh and alive. Taeblewalker had a great place up in the famous and magical City Island in his native Bronx, of great local color, fantastic sea food, restaurants, and even a local folkie cafe where he and other would perform. I soon began to sleep over, and it was a haul from where I live, and spend entire days gaming Scape and other games, and attending some great game days he hosted there. TW is also a member of the Inner Sanctum, and I got to participate in some of his CV play testing, and even had some input on a new card or two, like the Cathar Spearmen. TW is a very active site member like the others, and he writes many strategy articles, soon for our reviving publication. You can also see his name in the fan made custom manuals for our major game variations. I also got him into Battle Lore, which he plunged into with great abandon, designing races which its prolific author Richard Borg was not able to publish officially for the game, such as Elves and Lizard Men, to supplement the game system. Together we tried out almost all of the many expansions to that game, now technically defunct like Scape officially, but not on the tables of its devotees. The Gang of Four's Scape games were often very different from each other's. Rotating as GM each month, one of us selected a map and scenario, to chart a new path in his own version of Scape. Check out Kolakoski's old blogs for some of our more interesting games, some of which passed into Scape legend and were tried out by other Scape community groups through the site, such as Pirates! We played large point games on big maps, usually four player, although we occasionally had a temporary member or one time visitor to supplement our ranks. The unusual thing was that all four of us stayed as the core group through the years, something I have never seen before in all my own gaming history. We recently had a great 'final game' with all four of us, and it was as much fun as when we started out! There's nothing like a group project where the interests and tastes of the members overlap enough to provide great fun for all concerned!!! I'm sure I will continue to Scape and experiment with its many, many variations and possibilities. But it was this great group that allowed me to explore the game system all this time, and I want to thank you guys for the many fine experiences. Together we were able to offer each other many different visions and versions of Scape, while still feeding all of our enjoyment. This has included multiple boards that were somehow connected, theme games, Valhalla Society games (no guns), wild scenarios with differing rules and victory conditions, practice tournament games, supers games, all the Official scenarios published during the later life of Scape under DnD Scape, and many customs games with C3V/VC figures. There were mysterious islands to explore, teleportation portals to use, castles, steamy swamps, underground dungeons, battles on Valhalla with General Wars (even one including the Generals themselves), icy mountain passes, burning deserts, custom terrain enhancements, and many, many, many others. Scape On, guys! By the way, Tablewalker is now located about three hours north of The City, in that vast region of New York we call "upstate" (everything outside the NYC limits). He's now in Monticello, NY. Although he's just now settling in up there, if you live in that region, you might have the opportunity to game with and hang out with him and his wonderful (Scape and other game playing) fiancee. So get in touch with him here onsite and say hello. You'll be glad you did! I have to apologize for the shortness of this post. There's so much more to say. Normally I'd put it in a blog, but many people don't read them, and I wanted our numerous pals here to know about what is going on in The Big Apple. Things change, so seize your Scaping opportunities as they arise, rather than taking them for granted. I'm glad I did. Last edited by chas; December 15th, 2018 at 04:08 AM. I too have been involved with several groups over the years. They disbanded mainly because I was the one that moved away. I miss all the good times I had with them and stay in contact with many of them. Groups come and go but friendships are forever. And, as you know, you're always welcome at our monthly game table out here on Long Island. Looking forward to seeing you next Saturday! Thanks for the trip down memory lane, chas. I can still remember lugging my suitcase full of minis and terrain onto the subway to play games at Neutral Ground in Manhattan. Funny to think of how different things might've turned out for us if they'd managed to stay in business. Taeblewalker may be further away now, but at least we can still see him here on the site! A very heartfelt and welcome post, Chas. I will definitely make it a point to come down there when I can! I have been fortunate, I know, to be able to 'Scape with relatively responsible and supportive fellows for so long, and for us to have grown exponentially in our knowledge and enjoyment of 'Scaping. Sadly, the Gang of Four is being reduced to Three, as Taeblewalker is leaving our little group indefinitely. Chas is far more eloquent than I - see his post in the Heroscape General Forum - about the quality of the time we spent 'Scaping, and the unusual nature of the group. His kindness and generosity of spirit will be sorely missed, as will the unique perspective he brought to the table. I have only recently begun hosting the Gang at my place, with great enjoyment as anyone reading my blog posts can attest, and it remains to be seen how often the remaining Three will be able to gather together at one time in the future. This was where I was writing from in Negril, Jamaica. It's called Blue Cave Castle. I shall endeavor to incorporate elements of it into my next map. We stayed in Room 4 (cropped view from outside, view from, and interior pic, below). Last edited by kolakoski; December 29th, 2013 at 03:41 PM. I'm happy to say that Taeblewalker has been able to return after our "last" Scape game together before he moved away. He is now about a 2 1/2 hour drive upstate. You can usually keep up with what we're doing Scapewise monthly on Kolakoski's blog, which often reports on our adventures together with pictures! On his last visit three of us plus my pal 'Tag' played board games: Samurai Battles and Firefly the Game. I have a separate threads for SB onsite under Other Board Games, and discuss the new FF a lot on What Board Games Are You Playing? This Friday Jan. 10 we're experimenting with combining Supers with Classic/VC Scaping, in a scenario made up by Sherman Davies on his Amon Hen map. We'll be using six of SD's Marvel Supers Customs (see his own threads for Marvel and DC under Customs Comic Creations in the Marvelscape section). SD and I participated recently in Griznakh's supers game out on Long Island, using his great buildings, as we playtested the first 40 of his own Supers (see his separate super customs thread, custom terrain thread with amazing photos, and other of his works onsite, as well as his Long Island Scaping Group Events thread and annual tournament thread). I'd like to get to the point where we can use Supers from anywhere when we build our armies, so I can get more out from my huge files (see The Chas Supers Master Lists under Marvelscape/Custom Supers Creations). For example, I did a solo game using the C3G Mr. Terrific, and its a fun card to use, but haven't been able to get it into a group game yet! SD and I played two games recently where civilians were involved to be killed/rescued as alternate victory conditions. I'd worked on this in solo games myself. This next game will include this concept again. We're all pretty active onsite; for example so don't miss Taeblewalker's article in the revived issue of our Heroscape Codex magazine; I think the issue is over 50 pages long! And if you Scape or board game in NYC or will be passing through, let us know, we've had 'guest stars' both from the area and visitors in past games, and everyone is welcome to drop on by. Our only 'rule' if you join an 'official monthly' game is that you have to be willing to try out whatever the current GM turn taker puts on the table! We'll be happy to adjust to a different number of players for you. Last edited by chas; June 27th, 2015 at 11:13 AM. The specifics of the scenario we'll be playing can be found in The Gang of Four Returns! There will indeed be the usual battle report with pictures posted in my blog within a day or two after the games are completed. without Supes, but with VC customs, and Delta/Delta+ pricing. When Taeblewalker moved away, and Sherman was unable to make a number of games, I was afraid that it was all over for us. Now it appears that we'll be continuing to 'Scape together awhile longer. Someday, the Gang of Four will play its last game. I'm thankful that it hasn't happened yet, and hopeful that that day is far, far in the future. 'Scape on! Last edited by kolakoski; January 8th, 2014 at 01:33 PM. I've created and/or posted in various threads to address aspects of play particular to a future Gang game. My various attempts to cover all the bases in multiple forums was, according to chas, getting "loopy." Putting every idea I have into the threads I've started - my map/scenario thread, for instance - is awfully time consuming, especially given the myriad drafts. chas started this thread a couple of years ago, and I'm only now realizing that this is the only forum I really need to post in. So, for the time being, I shall post only here and in my blog. That being said . . .
We have now figured out how we will crush K. and TW.! Bet on the Good Guys to win! Which Supers are Good and which are Evil? We have been using my own suggested "definition" so far that anyone who has spent part of their comic book career as one or both alignment can be used as such. But as SD points out, almost every DC/Marvel/Independent character has switched alignment at one point or another. After discussing this yesterday with SD, the two of us are thinking of going back to each character's BASIC, most known orientation, to preserve a difference between the two camps for our Good vs Evil games, which are pretty frequent. This is always subject of course to the take of the current GM, who has to approve the cards for general balance and proper alignment. What do you think, K. and TW? And how do you do it, everyone else? Second thing first: As long as the distinction is clear, I have no problem either way. But, as in my earlier example - the Predators, some units' alignments may be in doubt regardless. Last edited by kolakoski; March 22nd, 2015 at 06:08 PM. Note that the link "Secret Wars" in the above post goes to K.'s blog, where the scenario and supers cards being used for this week's Taeblewalker game are all there for your perusal! *Next month will be a game by Sherman Davies. No details have been revealed yet, but it's sure to be a big finish for his Supers In Valhalla series. In the next game, the superheroes return from ScapeWorld to fight 'normal' supervillains on that most abnormal planet, Earth! *Then Kolakoski's first ever Supers game (where he's the rotating Game Master), with a brand new experimental point system. *After that it will be my turn, and my new Tech Squad will be featured (see my Supers Custom thread). Ah, but how...there are so many ways to use it/them! Loki has infiltrated the Tower of London in an attempt to steal the Crown Jewels, which he has discovered contain a previously unknown Infinity Gem. Odin discovers this new plot and warns Earth's heroes, who rush to England to foil Loki's plan. They arrive too late to stop Loki from getting his hands on the Crown Jewels, but their arrival forces Loki to deal with them while trying to cast a spell of escape. Unfortunately for the heroes, Loki has not come alone - the Enchantress and her champion Skurge stand with the god of mischief, along with a cadre of Marro and other creatures from the Nine Realms. The Evil team starts in the red start zone spaces, while the Good team starts in the blue start zone spaces. The Fortress Door must be destroyed in order for the Good Team to advance beyond their start zone; no movement of any kind is allowed out of the Good start zone until the Fortress Door is destroyed. The Fortress Door has 8 Life in this scenario. No figures can move onto the top area of the Fortress Door. Last edited by Sherman Davies; March 27th, 2015 at 01:39 PM. We gathered more or less on time, a rarity for us. After Sherman regaled us with some bathroom humor concerning Beyonder and Spiderman, and we finished our relative repasts and refreshed our beverages, the armies, cards, markers, dice, and dice trays being already in position (thanks to chas, He Who Owns All of Heroscape), we were ready to begin. The map was as advertised, flat out gorgeous, an excellent choice by Taeblewalker. We scouted about after dark, and spotted Beyonder in the distance. After checking out the interior, only a dark shadow visible in our intelligence pictures, we returned to our Start Zone. Taeblewalker, playing his role of arrogant Doctor Doom to the hilt, refused to discuss strategy, other than to declare his intention to charge out with Braxas into the teeth of the do-gooders' defense. Braxas fell almost immediately. Then Taeblewalker had another of those runs of bad luck he is prone to, and lost the rest of his army in short order. My ranged strategy fell apart rapidly, as I over extended Magneto, who fell after being summoned by Beyonder. I found myself threatened by, and ran around trying to avoid, one on ones with Thor. Spawn tried to be thuggish, but 9 Lives go fast with only 4 Defense against 9 Attack. Spawn initially took a shot at the McDirks with his Heavy Machinegun, but whiffed his first roll. They were soon thereafter no longer a threat, their Champion, Captain Marvel, having been offed. This game has already been 'pretested' out at Islandscape successfully by Sherm with other players, which usually doesn't happen with our scenarios. I chose first, and then Kolakoski did his usual excellent job of hitting our common points allowance right on the nose! Last edited by chas; March 29th, 2015 at 12:39 PM.